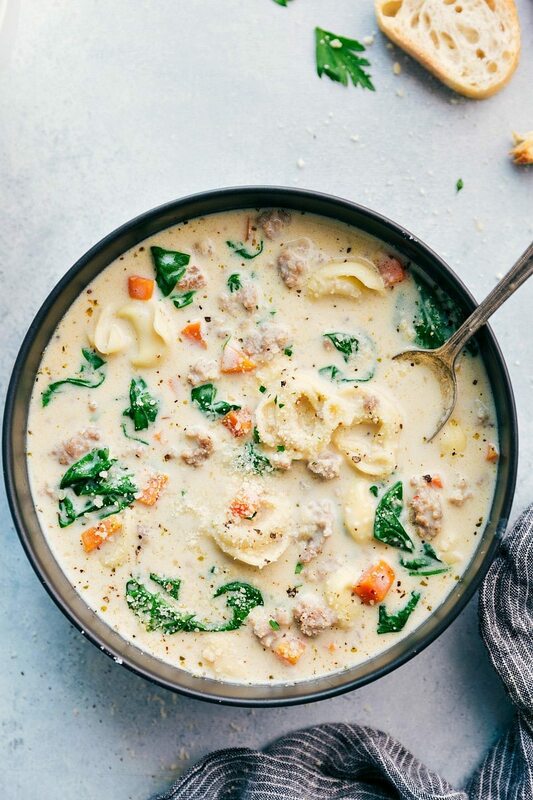 This ultra creamy and delicious soup is packed with flavor — Italian sausage, cheese-filled tortellinis, vegetables, and herbs. 30-minutes from start to finish! The toddler has become very fascinated with pictures and cameras the last few months. My phone has about 83,203 pictures of his nose and face, our IPad is out of memory from so many pictures, and he’ll even help me snap a few shots for the blog on my camera. He’s showed such a consistent interest that I finally bought him his own toy camera. It’s bright blue and actually has a memory card to save the pictures. It also has games on it and plays music. When he first got it I asked him, “What are you going to take pictures of today?” And he said, “My breakfast.” Haha. Definitely my son. When we’re taking pictures together he’ll pause to play a game on his camera and then tell me: “mom, maybe you need to get a new camera because yours is old and doesn’t have cool games OR music.” He also informed me that my black camera is a little boring and would be a lot cooler if it was blue and/or had stickers on it. 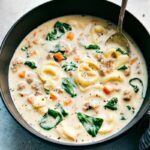 Several years ago I shared a creamy chicken tortellini & veggie soup which so many of you have absolutely loved! It’s also a soup my husband requests every single Fall which is kind of a big deal because when we were dating he claimed that he didn’t like soup and it was never filling enough for a full meal. 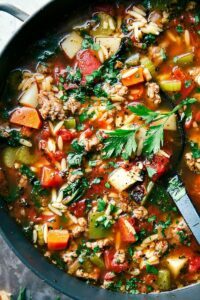 This soup is so quick and easy to make and sure to be a cold winter staple! Enjoy! 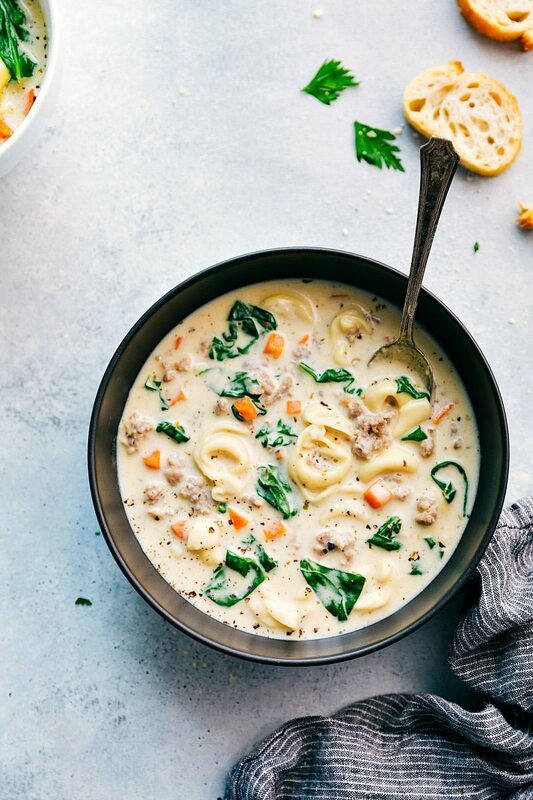 This ultra creamy and delicious soup is packed with flavor -- Italian sausage, cheese-filled tortellinis, vegetables, and herbs. 30-minutes from start to finish! In a large pot over medium-high heat, cook & crumble the sausage until browned. Transfer the cooked sausage to a paper-towel lined plate and dab with another paper towel to get rid of the grease. Set aside. Keeping the pot at medium-high heat, add in the olive oil along with the diced onion, and peeled & diced carrots. Saute, stirring occasionally, for 5-7 minutes or until the vegetables are soft. Add the garlic and saute for one more minute, stirring occasionally. Add in the butter and allow to melt. Once the butter is melted, whisk in the flour and cook, stirring constantly, for 1 minute. Slowly add in the chicken broth or stock, whisking to combine. Continue cooking, stirring occasionally, until the mixture reaches a simmer. Reduce the heat to medium-low and allow to simmer and thicken for about 5-8 minutes. 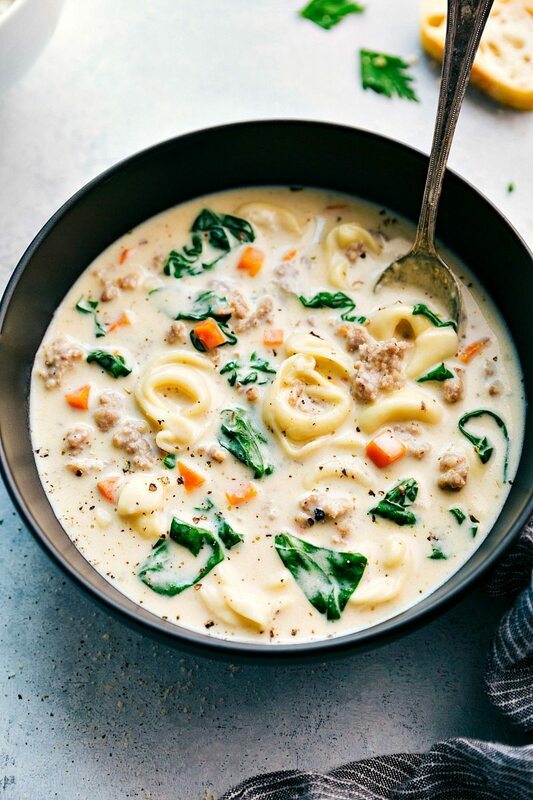 Add the cooked sausage, Italian seasoning, tortellini**, salt & pepper (to taste, I add about 1 teaspoon salt and 1/2 teaspoon pepper), spinach, and half & half or heavy cream to the pot. Stir and then simmer or medium heat for about 5 minutes or until the spinach is wilted and the tortellini is cooked through. Serve immediately with freshly grated parmesan and crusty baguette, if desired. 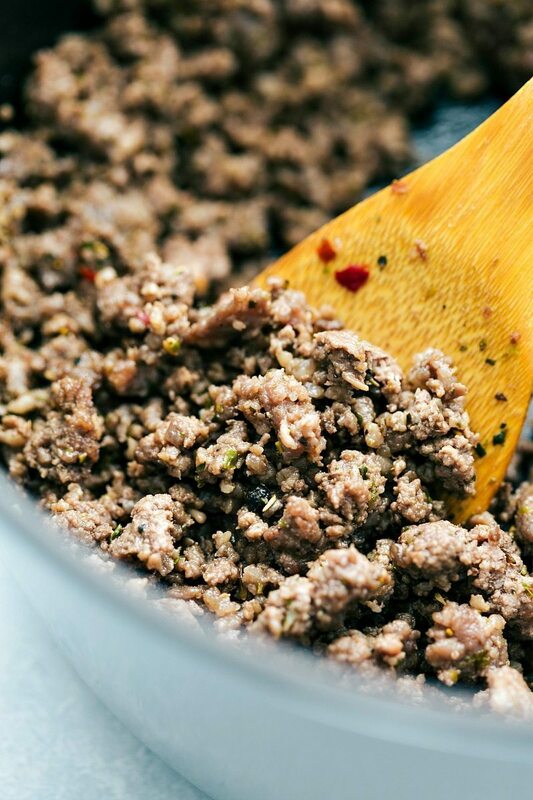 Wondering if you have a favorite Italian sausage that you and your family like? We’ve tried a few and seem to be having bad luck! We’ve made this twice and both times it’s a hit!! I make it exactally to the recipe, but add 20 ounces of tortellini ( because I’m too lazy to find a smaller package or use the extra in another dish). 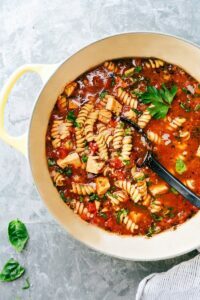 It’s delicious and even more so the next day – it almost turns into a creamy pasta dish instead of a soup. We cook the tortellini in the soup, refrigerate with the tortellini in the soup, and reheat all together on the stove or microwave. It’s great for lunch the next day at work or for dinner, too! Thank you for this delicious recipe!! Super creamy and filling! Really good. I paired it with a buttery Chardonnay from Monterey, CA. Doubled the recipe for a church potluck tonight and it was a hit! Everyone was asking for the recipe. Sending them to your site. Looking forward to trying your other recipes. Thanks! Thank you Joy! 🙂 So happy this was a hit!! Wow! 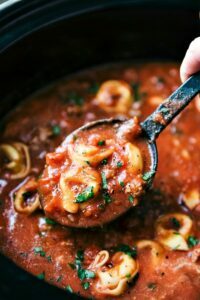 This soup is so flavourful! My picky husband even loved it. The only change I made was to cut down on the amount of tortellini, just a personal preference. Otherwise, I followed the recipe exactly as written. I will be making this soup often. It’s so easy and fast to make, and yet elegant. I can see making this for unexpected company! Made this recipe I use spicy Italian sausage. Makes it a little hotter if you like spice. Great Recipe. Cheers!